In the opening pages of "The Hitchhiker's Guide to the Galaxy" by Douglas Adams, alien Ford Prefect walks into an English pub on a Thursday morning and orders six pints of beer for himself and earthling Arthur Dent. He tells the bartender to make it quick because the world is about to end. That Ford and Arthur are drinking so much beer at that time and place is significant to the story. The character and personality of the bartender are not, so Adams presents him as exactly the kind of cliche many readers would expect. He's the type of world-weary working man who has seen all types enter his pub and say and do all sorts of outlandish things. He's not about to be shocked by two eccentrics who are drinking heavily on a Thursday morning and think the world is about to end, so he responds unemotionally by saying it's a nice day for it and attempts to engage Ford in a conversation about an upcoming soccer match. The bartender, in this case, is what is known as a stock character. He serves no meaningful purpose in the story except to serve the beer, so his words and actions are limited. 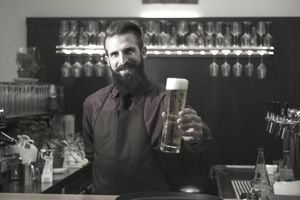 While Adams plays up the humor of the scene, the bartender still is presented in a way that does not distract from the elements of the story that truly is important. Such stock characters are prevalent in all forms of storytelling, draw from widely known cultural types for their characteristics and mannerisms, and often are used in parody. Every culture has its own set of stock characters. In Italian commedia dell'arte, for example, Scaramouche epitomized the unscrupulous and unreliable servant. In modern American culture, James Thurber's Walter Mitty created the mold for the hen-pecked husband and dreamer. In American culture, the TV sitcom "The Simpsons" is one of the most popular homes for stock characters. The entire city of Springfield, where the show is set, is populated by stock characters: TV news anchorman Kent Brockman, Comic Book Guy, mob boss Fat Tony, the town drunk Barney Gumble, Reverend Lovejoy, school bus driver Otto Man, school bully Nelson, and many, many more. Each character is meant to represent a specific stereotype that can be played for humor. As well, each stock character is available to fill their role whenever needed. For example, if an upcoming story involves political corruption, the writers use Mayor Quimby in the story. If it involves law enforcement, Chief Wiggum is the character for the job. Because the show has been in existence for so long and because there are so many stock characters in the cast, writers have multiple options at their disposal when they need to satirize a particular stereotype. One of the most prominent stock characters on the show is Kwik-E-Mart owner Apu, who also represents the risks that come with creating racially based stock characters. It's easy to get the details wrong, and incorrect stereotypes may offend the audience. In the case of Apu, writers have been accused of perpetuating a negative stereotype, but some have defended the use of Apu by arguing that he is used to satirize negative stereotypes. Either way, controversial stock characters can take audiences out of the fictional dream. While stock characters often are in the background, protagonists and antagonists in stories also can be based upon stock characters. These characters are more fully developed, and often the goal of the writer is to give readers a character with a foundation that is familiar to them, then present the character with a different twist or put the character in an unexpected setting. One of the most popular variations of this approach is the use of the antihero as a story's main protagonist. In American literature, "The Adventures of Huckleberry Finn" by Mark Twain is a classic example. Huck is an antihero because he does not follow society's conventions, but he still does the right thing. For example, instead of turning in Jim, a slave who has run away, Huck goes against what society expects and attempts to help Jim in his quest for freedom.